* Share price as of close on November 7, 2014. Number of Shares Outstanding is calculated by extracting treasury shares from number of shares outstanding considering number of shares offered in third party private placement decided on January 1,2015. ROE is actual in the previous fiscal year. This Bridge Report provides details of Nihon Enterprise Co., Ltd. and information pertaining to earnings results for the first half of fiscal year May 2015. Nihon Enterprise is a "mobile solutions company," with two main business segments. One is the mobile content segment, where various contents including lifestyle and traffic information services are created and distributed to smartphones and other mobile devices. The other is the solutions business segment, where contents creation and operations, system integration, advertising business (In-Store affiliate), reverse auctions, IP phones and other solutions (Cost reduction) are provided. Furthermore, Nihon Enterprise is also promoting efforts to expand its business into overseas markets , and has been a frontrunner in domestic contents provision in China and India. The Nihon Enterprise Group is comprised of eight consolidated subsidiaries including the company Dive Co., Ltd., which provides advertising business, At The LOUNGE Co., Ltd. which provides music related services, Advanced Traffic Information Services, Corporation (ATIS Corp.), which provides traffic and other information services, 4QUALIA Co., Ltd., which provides web and mobile site development and maintenance services and contents development, HigLab Co., Ltd., which conducts native application development as part of the mobile contents business, Enterpise (Beijing) Information Technology Co., Ltd., which operates cellular telephone retail shops in addition to business management in China, Beijing YZH Wireless Net Technology Co., Ltd., which provides mobile contents planning, development and distribution, and Rice CZ (Beijing) New media techonology Co., Ltd., which provides IT related educational services. The Group also boasts of another four non-consolidated subsidiaries including and One, Inc., which provides voice communications related solution services, Aizu Laboratory, Inc., which provides smartphone application planning and development, Rice MC (Beijing) Digital Information Technology Co., Ltd., which provides mobile contents distribution and character licensing services, and NE Mobile Services (India) Private Limited, a local company operating in India. With regards to the content service segment, Nihon Enterprise will fortify the foundation of its earnings, which are monthly subscription and fixed rate contents on the official carrier websites. Furthermore, toward deploying its "contents platform" on a global basis, synergies will be pursued through linking mutually "native apps" of which the company put efforts to fortify the lineup primarily games and a "messenger app" , which has gotten off to a good start . Within the solutions business, efforts are being implemented to ensure that growth is seen in the key growth realms of consigned development projects (Smart devices), advertising services (In-Store affiliate), operational support services (softphones, messenger apps, others), and collaborative models (Alliance type). Business Strategy:	Global Deployment of "Contents Platform"
Sales to smartphone related applications accounted for 68% of this segment's sales during the second quarter (September to November). Expansion in application provision via official carrier website monthly subscription and fixed rate carrier services contributed to fortification of Nihon Enterprise's earnings foundation. In addition to continued efforts to expand both official carrier website monthly subscription and fixed rate carrier services, Nihon Enterprise will also conduct efforts to cultivate and strengthen native applications of contents which can be purchased in the app markets such as "App Store" and "Google Play" and deploy "contents platform" on a global basis. Native applications is a term used to describe game and other applications which can downloaded to and used on smartphones and other digital devices. Previously, online browser applications requiring no download had been used by feature phones due to the limit of their ability. Nihon Enterprise is implementing a strategy of growing earnings by expanding sales channels by pursuing horizontal deployment of contents (Secondary usage of carrier fixed rate services), implementing SNS promotions, seeking out alliances with operators of other websites, and pursuing collaborative partnerships with cellular telephone distributors. The number of cellular telephone stores with which the Company has transactions is steadily expanding. In addition, work for declining birthrate countermeasures from Chiba Prefecture has been booked on a consigned basis and results validation is being conducted for the development of a smartphone application called "Chiba Woman Diary". Furthermore, aggressive SNS promotions will be conducted to increase the brand awareness and member numbers of these services, and horizontal deployment to carrier fixed rate services will be implemented to make secondary usage of contents. Fixed rate services are expected to achieve higher levels of profitability through the secondary usage of contents. Currently, contents are provided on a fixed rate service basis to "au Smart Pass" (KDDI), "Sugo Toku Contents" (NTT Docomo), "App Pass" (Softbank Mobile), "Appli Cho Bodai" (Source Next), "Yahoo! Premium" (Yahoo), and "AppSeru" (XL Axiata in Indoesia). Nihon Enterprise provides the largest number of contents on a fixed rate service basis to "au Smart Pass", the first company to conduct fixed rate services. However, the more popular contents provided over "au Smart Pass" will also be gradually provided to "Sugo Toku Contents" and "App Pass" platforms as well. With regards to native applications, native applications including games (Original native games), tools (Tool applications which can be used with other applications), healthcare (Physical and mental health support application for women) and communities (Bulletin board style schedule sharing application) will be fortified. At the same time, Nihon Enterprise plans to deploy"contents platforms" for smartphone in coordination with "Fivetalk" free chat application, which boasts of over 2.00 million downloads) as a means of cultivating business not dependent upon official carrier websites. 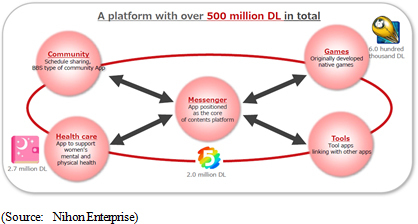 "Fivetalk" seeks to differentiate itself by fortifying its functionality to achieve 10.00 million downloads and to collaborate with other applications as a platform. Aside from this development, downloads of the women's health support application "Woman's DIARY" and game application "NekoPing! Planet" have grown to achieve over 2.70 and 0.60 million respectively. Nihon Enterprise will seek to increase its users of "Woman's Diary", create methods to monetize this application because of its high ratio of active users, seek to achieve 5.00 million downloads, and create new business models through collaboration with other applications. As part of the process of monetizing "NekoPing! Planet" application, improvements in usability and new functions will be pursued. In addition, three casual game titles are expected to be launched within fiscal year May 2015. During the first half of the current term, advertising (In-Store affiliate) expanded steadily, facilitation of a development and sales structure for operational support service (Softphone, messenger, others) progressed, and overseas businesses (Cellular telephone sales stores operation in Shanghai, China) turned profitable. With regards to the advertising business, sales rose on the back of NTT Docomo's promotional efforts to expand handset sales during the first quarter of fiscal year May 2015 (June to August), however continuation rates declined. In response to this development, efforts implemented during the second quarter (September to November) to increase the continuation rate contributed to a decline in sales, but the total number stores with which business is conducted increased through developing new affiliated partners, allowing sales to recover to relatively high levels. In the operational support services business, development of the IP softphone application "AplosOne Softphone" (Application that allows smartphones to be used as internal telephones within companies) and the corporate messaging application "BizTalk" were completed and sales were started. "BizTalk" is a messaging application designed for corporate users that allows for sharing of information and communication with robust security (Ability to limit these functions to communication devices with access to servers) capability necessary for business operations, with chat, message stamps, visual image transmission, illustration creation and transmission, telephone, pass code lock, and other fundamental functions. Therefore, this application is easy to implement and it can also be customized to match the needs of individual clients. At the same time, "AplosOne" free telecommunication application using smartphones as internal phones boasts of all of the fundamental functions of business phones. Aside from these applications, other services including packages that can be used with the reverse auction "Profair" (Purchasing support system) are being developed as a means of differentiating services and expanding sales. In addition, facilitation of the sales structure including direct sales and sales through agents was promoted during the first half, and a structure capable of cultivating the some 10,000 large corporations, 510,000 midsized corporations and 3.34 million small businesses has been established. ① The ability to use smartphones as internal telephones eliminates the need to have normal business phones (Fixed line phone) at each desk. "AplosOne Softphone" distributes equal usage environment with conventional internal telephones using business phones, for instance, phone calls from outside of the company to fixed line phone numbers can be diverted to employees' individual smartphones. ② Internal calls from headquarter facilities to employees at regional offices can be made free of charge. ③ Application allows for "WEB Contact List" function to be shared by all handsets and allows internal extensions and client phone numbers to be centrally managed by administrators. ④ Calls to outside numbers showing normal fixed line phone numbers (Including the normal regional area codes of 03 for Tokyo, 06 for Osaka, and other regions) is possible, allowing differentiate personal billings from expenses for business. Cellular telephone sales shop operations are conducted in Shanghai, China (Two shops affiliated with China Telecom are operated), and efforts are being conducted to insulate the earnings of this business from the influence of marketing strategies implemented by carriers (Sales during fiscal year May 2014 severely declined due to changes in marketing strategies of China Telecom). Specifically, fortification of marketing to large corporate clients, sales of accessories, and efforts to reduce overall costs including optimized allocation of human resources to reduce labor costs are being promoted with the goal of turning the operating loss of this business to profit during first half of fiscal year May 2015 on the back of a bottoming in sales. Sales during the first half rose by 15.7% year-on-year to ¥2.514 billion. Content service business sales rose by 8.2% year-on-year on the back of favorable demand for games and traffic information services, and solutions business sales rose by 24.8% year-on-year on the back of a 2.1 fold increase in advertising sales (In-Store affiliate). At the same time, operating income declined by 60.9% year-on-year to ¥62 million. While cost of sales improved by 0.4% year-on-year to 51.8% on the contribution from carrier fixed rate service contents in the content service business, aggressive advertising spending (¥209 million in 1H-FY5/14 rose to ¥428 million in 1H FY5/15) and subsequent higher sales, general and administrative expenses were left unabsorbed. The increase in net income is attributed to profit on the sale of investment securities of ¥331 million booked as extraordinary income (Profit on sale of investment securities in the previous term amounted to ¥107 million). Analysis of advertising and promotional expenses in the three main services of In-Store affiliate, fixed rate services, and native applications reveals that the investments in advertising and promotions for fixed rate services were recovered within the month that they were made. However the recovery in In-Store affiliate related advertising investments required 6 to 10 months and that for native applications are considered to require a longer period of time. In addition, In-Store affiliate sales can be divided between sales of company's own contents via official carrier websites (Acquisition of monthly subscription based members in the content service business) and sales of contents created by other companies (Advertising in the solutions business). Both the number of monthly subscription based members and carrier fixed rate service users rose, allowing traffic information sales to rise by 16.7% year-on-year. At the same time, strong demand for browser games for carrier fixed rate services allowed game sales to rise to 3.5 times. Lifestyle information sales were able to rise on the back of carrier fixed rate services. The number of affiliate stores is increasing on the back of successful efforts to cultivate collaborative sales agents in the advertising business. Sales rose to a new record high during the first quarter (June to August) on the back of increases in handsets sales by NTT Docomo arising from its fortified sales promotion, and sales continued to trend at high levels during the second quarter (September to November). In addition, sales of overseas business appear to have bottomed on a quarterly basis (Turned to profits due to improvement in efficiencies and cost reductions). At the same time, the occurrence of numerous validation projects can contribute to fluctuations in sales on a quarterly basis in the solutions business, but Nihon Enterprise boasts of a large amount of development work for smartphones and tablet applications. During the current third quarter (December to February), development work is progressing smoothly as the anticipated peak in validations. While quarterly earnings can fluctuate considerably, Nihon Enterprise is able to maintain overall sales growth and is realizing improvements in gross margin. In the solutions business, sales of advertising fell largely due to the impact of the sales promotion of NTT Docomo during the first quarter (Terminal sales increased). However there were seasonal factors that influenced advertising sales during the first quarter, and quarterly sales would have approached the previous record high of ¥254 million recorded in the third quarter of fiscal year May 2013 if this seasonality is factored out. Changes in the rules for distribution of earnings for carrier fixed rate services by some carriers negated some of the favorable trends in games but are deemed to be a temporary factor. Sales of traffic information, which had fallen compared with the first quarter, continued to trend at close to record high levels. Aizu Laboratory Inc., which conducts development of applications for iOS and Android and consigned development, was turned into a subsidiary on November 28, 2014. Aizu Laboratory was established on January 4, 2007 as a venture company by University of Aizu with capital of ¥29 million. The addition of Aizu Laboratory as a subsidiary is expected to contribute to expansion of business realm of applications developed by Nihon Enterprise through joint research with universities and government bodies, provision of a sustained supply of engineers, and fortification of native application development capabilities. Total assets declined by ¥216 million from the end of the previous term to ¥5.324 billion at the end of the first half due in part to the sale of investment securities. Moreover, the financial standing of Nihon Enterprise remains healthy due to the lack of any debt, and a strong 473.2% current asset ratio, which exceeds the 100% safety level for short term payments. At the same time, the noncurrent ratio stood at 33.4%, which is well below the maximum long term safety level of 100%. Equity ratio at the end of the first half was 76.9%. The decline in operating income contributed to an expansion in the net outflow of operating cash flow, but withdrowal of time deposits and the sale of investment securities contributed to a net inflow of free cash flow of ¥86 million in the current first half compared with a net outflow recorded in the previous first half. At the same time, an increase in dividends at the end of the previous term (After considering the stock split, dividend was raised from ¥1.8 to ¥3) contributed to an increase in the net outflow of investing cash flow. Full year earnings estimates, which were revised on November 28, remain unchanged. Sales are expected to rise by 13.8% year-on-year to ¥5.130 billion. In addition to the favorable trends for carrier fixed rate services and increases in advertising expected in the second half, validation of consigned development is expected to progress smoothly. While extension in the development period for the new service "AplosOne Softphone" caused sales to slip lower, favorable trends in advertising and other existing businesses helped to supplement this shortfall and is expected to allow sales to remain basically in line with the initial estimates. However, increases in development expenses for games and other native applications and higher advertising expenses accompanying fortification of marketing are expected to negatively impact profits. The aggressive promotion of "NekoPing! Planet" game application and "Fivetalk" free chat application created by the consolidated subsidiary HighLab and subsequent higher advertising expenses are cited as reasons for the shortfall in profits. Advertising expenses rose from ¥515 million in the previous term to ¥724 million in the current term, and represent a ¥124 million increase from the initial estimates for advertising of ¥600 million. HighLab is a strategic subsidiary that was established in April 2014 to conduct activities to deploy "contents platform" through mutual collaboration among a messaging application and other applications on a global basis and to develop games and other "native applications." Dividends are expected to remain in line with initial estimates announced at the term start of ¥3 per share. This reflects an increase of ¥1 to replace the commemorative ¥1 dividend, which is being eliminated, and represents a dividend payout ratio of 65%. A new share issuance and secondary offering were conducted in December 2014. The funds sourced from this new share issuance amounted to ¥853 million, and will be used for network investments, hiring of personnel with specialized skills, outsourcing, labor expenses, fortification of the development structure for corporate information systems in the solutions business, and strengthening of the development structure for native applications of game contents in the content service business. In addition, the secondary offering of shares is undertaken with the goal of increasing liquidity in the market and diversifying the shareholder distribution. In addition to the public offering and secondary offering, a third party placement will be used as a "secondary offering through overallotment" with subscription deadline of January 21, 2015. This third party placement is expected to raise an additional ¥153 million, which will be used for the same purposes as described above for the funds raised through public offering. Sales are expected to rise by just under 14% during the full year. And despite volatility in earnings on a quarterly basis, this increase in sales is attributed to growth in existing businesses, consigned development of smartphone and tablet applications, advertising, carrier fixed rate services, and monthly fixed rate services. And while profits are expected to decline during fiscal year May 2015, operating income could rise by 31% year-on-year to ¥440 million if advertising expenses were to be restrained to levels seen in the previous fiscal year. Consequently Nihon Enterprise has taken the decision to forgo near term profits in the coming term in favor of making anticipatory investments that will lead to sustained business expansion in the coming terms. Consequently, fiscal year May 2016 is expected to become a year for Nihon Enterprise to cultivate results of its various efforts in the realms of native applications and operational support services. The acquisition of a venture company established by University of Aizu is another development to watch closely. Furthermore, Nihon Enterprise's efforts to sell futuristic contents in Shanghai and other regions of China through its cellular telephone shop operations is yet another important business which can become a significant contributor to future growth.